It’s been a huge year of change for me. Months of back to back travel, graduating as a yoga teacher, setting up a teaching schedule and taking time to dive into where I want to go next has been a little bit of a rollercoaster. I really thought that with all this added “stuff” my personal yoga practice was going to take a hit but in fact the opposite happened. The more time I spent away from my mat the more I craved it. And the more time I spend alone on my mat the better my intuitive understanding of my body becomes, and stronger my relationship with myself grows. So, I wanted to share four key take aways from my yoga practice this year. Meditation was a significant part of my teacher training and this time last year I had absolutely no interest in it! But I had to learn about it for my course, so I began to practice a five minute breath awareness meditation each morning. The result was nothing short of spectacular. My job can be extremely stressful at times, and I’ve walked away from my computer in tears some days but there was noticeable difference in my stress levels when I started meditating. I stopped doing wheel! Totally. I spent a lot of time in my head about my feelings around wheel pose, and what I was getting from it and what I wanted from it. Wheel has NEVER felt good to me; I almost always have insane compression in my shoulders and my back, I dread practising it, I hate how I can’t do it when I’m in it and generally it just breeds frustration. But, will the world end if I don’t practice wheel? NOPE. I stopped, and when I stopped I realised that I hate wheel because I am not strong enough to maintain it safely. So in place of wheel I did cobra pose, camel pose etc to strengthen my back and resistance training to strengthen my Serratus Anterior (key muscles for safe inversions). I’m not ready to fully commit to having wheel back in my life yet, but on the occasion that I do practice it I feel better; stronger. Point two leads very nicely into point three. You always hear people saying “yoga is not about being flexible” – it’s such an over-used, throw away phrase especially when it’s not followed by an explanation! 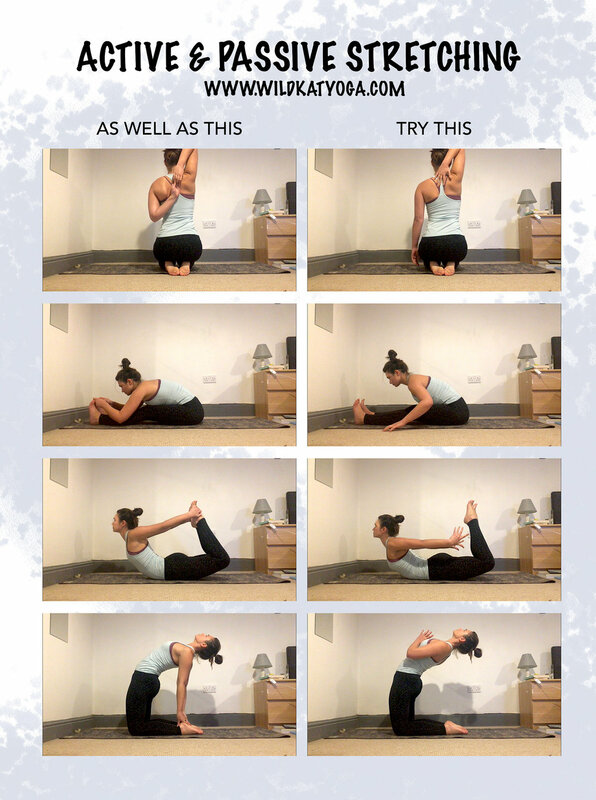 But whilst yoga does help you become more flexible there are some parts of your body that will never become more flexible/open if all you do is stretch the muscle over and over again. In fact this is just plain dangerous. In July 2017 I had a hamstring injury that resulted from this mindset. I was pulling and pulling at my hamstrings and I could do a cracking compass pose, but what I should have done instead of feeling all awesome about it is asked myself SHOULD I be doing Compass Pose? During the course of this year I dealt with a lot of ego around my hamstring flexibility, and when I let go of feeling irritated about it I discovered that the best way to get my flexibility back was to gain strength here first. I also learned a valuable difference in passive stretching versus active stretching. IE where are you just yanking yourself into a shape to try feel a stretch versus where is your body strong enough to take you into this shape. Neither is necessarily wrong, but I think it’s interesting way to check if you “need” more flexibility, or if in fact you need more strength. You can check where you are with this by taking yourself into a pose eg. Dancers Pose and then releasing your hold and seeing if your body is strong enough to maintain the shape. People think yoga is a kind of one-stop shop; it will make them, strong, flexible, at peace, rich, look good in yoga pants etc etc . Maybe that’s true for some people, but not for others. Honestly I’ve had this revelation before, but it sneaks in again and again and this year it was all about my forearm stand. Last year I expected that if I practice forearm stands every day I will eventually be able to do a forearm stand. I couldn’t do it – I saw virtually NO progress here in near on two years!! I immediately blamed it on the yoga; “you’re not giving me what I expected,” I told it! This inner chat just makes me resentful of my practice and of my body. Thanks to mediation and mindfulness I am lucky enough that I can notice when I am doing that! And now I look at my yoga practice as way to compliment anything else I am doing. Half way through the year I put my obsession with pinchamayurasana aside. I decided to increase my strength training to build upper strength to support my forearm stands. Guys lemme tell you that since I have done this, I can forearm stand no problemo. Who knows what will happen next year. I am currently working around a shoulder injury and using this as an example to understand the strength that my upper body does and does not have. I am still working on Pincha, but now I am doing it with kindness. As well as handstands and intuitive back bending using strength as well as flexibility; who knows maybe next year you will see me doing wheel again! Whatever you are working on in your practice it’s important to stay mindful of how you treat yourself based on the results. And if not being able to do a pose is resulting in negative inner chatter then take this as an opportunity to think about how you can lay better foundations for that pose. And mainly, can everyone just start meditating please. Thanks.